Cockroaches (or simply "roaches") are insects of the order Blattaria. There are about 4,000 species of cockroach, of which 30 species are associated with human habitations and about four species are well known as pests. 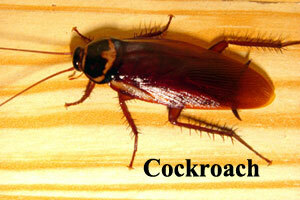 Cockroaches have been known to live up to three months without food and a month without water. Frequently living outdoors, although preferring warm climates and considered "cold intolerant," they are resilient enough to survive occasional freezing temperatures. This makes them difficult to eradicate once they have infested an area. There are numerous parasites and predators of cockroaches, but few of them have proven to be highly effective for biological control. Wasps in the family Evaniidae are perhaps the most effective insect predators, as they attack the egg cases, and wasps in the family Ampulicidae are predators on adult and nymphal cockroaches (e.g., Ampulex compressa). The house centipede is probably the most effective control agent of cockroaches, though many homeowners find the centipedes themselves objectionable. Ampulex wasps sting the roach more than once and in a specific way. The first sting is directed at nerve ganglia in the cockroach's thorax; temporarily paralyzing the victim for 2-5 minutes, which is more than enough time for the wasp to deliver a second sting. The second sting is directed into a region of the cockroach's brain that controls the escape reflex, among other things. When the cockroach has recovered from the first sting, it makes no attempt to flee. The wasp clips the antennae with its mandibles and drinks some of the hemolymph before walking backwards and dragging the roach by its clipped antennae to a burrow, where an egg will be laid upon it. The wasp larva feeds on the subdued, living cockroach. Bait stations, gels containing hydramethylnon or fipronil, as well as boric acid powder, are toxic to cockroaches. Baits with egg killers are also quite effective at reducing the cockroach population. Additionally, pest control products containing deltamethrin or pyrethrin are very effective. In Singapore and Malaysia, taxi drivers use Pandan leaves as a cockroach repellent in their vehicles. In Russia, some people, after opening all cupboards, leave a saucepan half-full of sulfur burning on a gas ring, then quickly come back in to switch it off (with gas mask) and leave the residence for a few days. This is said to be protective for ten years. An inexpensive roach trap can easily be made from a deep smooth-walled jar with some roach food inside, placed with the top of the jar touching a wall or with sticks leading up to the top, so that the roaches can reach the opening. Once inside, they cannot climb back out. An inch or so of water or stale beer (by itself a roach attractant) will ensure they drown. The method works well with the American cockroach but less so with the German cockroach. A bit of Vaseline can be smeared on the inside of the jar to enhance slipperiness. The method is sometimes called the "Vegas roach trap" after it was popularized by a Las Vegas-based TV station. This version of the trap uses coffee grounds and water. Some of the earliest writings about cockroaches encouraged their use as medicine. Pedanius Dioscorides (1st century), Kamal al-Din al-Damiri and Abu Hanifa ad-Dainuri (9th century) all offered medicines that either suggest grinding them up with oil or boiling them. The list of ailments to be treated included earaches, open wounds and "gynecological disorders." Pest control is cited as one of the reasons for reduced populations of cockroaches in ex-USSR countries.